With crossover RPGs all the rage these days (think Cross Edge or Dissidia: Final Fantasy) it comes to no surprise that next Tuesday will see the release of yet one more with Kingdom Hearts 358/2 Days. This Disney meets Final Fantasy RPG will be releasing for the Nintendo DS. 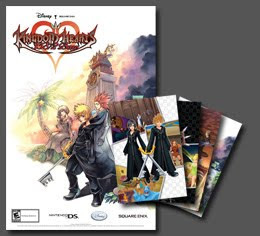 If you're thinking of picking up the game, and knowing the popularity of the KH series that would be many of you, it might interest you to know that GameStop and EB Games Canada are offering a pre-order bonus consisting of a limited edition poster and five postcards.